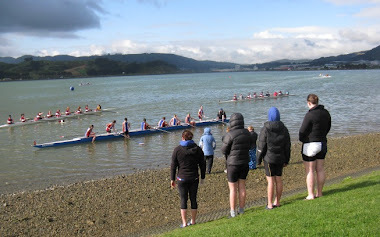 Welcome to the Porirua Rowing Club blog. It's a new season and we're trying something new with our own web page to keep you posted on club news. If you have ideas, suggestions or photos for the blog please email the novice blog crew. The 2011/2012 season is getting underway with its usual enthusiasm. The Club AGM elected a new (but familiar) committee and to get our season off to a fast start we've already had one fundraiser. To pull in new rowers we're having open days and a free 'learn to row' course in September. So if you know anyone who might make a good, keen rower... get them down to the club or email porirua.rowing@gmail.com for more information.